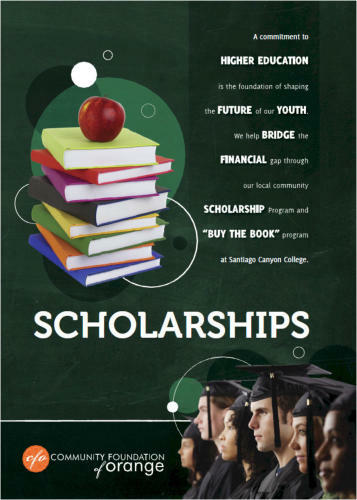 The Community Foundation of Orange STEM Scholarship Program was established in 2019 due to the generosity of Edison International (SCE). The fund will award 5 scholarships of $1,000 each to an Orange Unified School District high school senior pursuing a bachelor’s degree in one of the STEM Majors: Science, Technology, Engineering, Mathematics. Priority will be given to those who have demonstrated community service involvement in the City of Orange. The Community Foundation of Orange Maxine Huber Scholarship was established in 2019 to recognize the legacy and generosity of the late Maxine Huber, who graduated from Orange High School in 1936. The fund will award 1 scholarship of $1,000 to an Orange High School senior pursuing a bachelor’s degree. Priority will be given to those who have demonstrated community service involvement in the City of Orange.